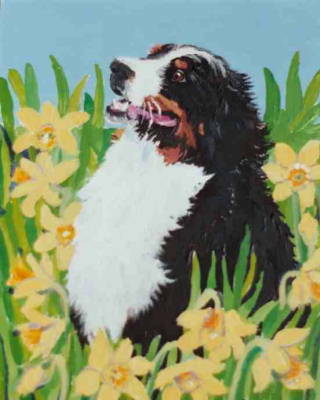 Vote for Michael Johnson, ArtPrize® 2010 - The Longlease Bernese Mountain Dog Berner Art Page. Michael Jurogue Johnson is a full time artist. Michael was born with a sense of wonder, an ability to appreciate simple things, a good sense of humor, and the determination to communicate with others. "I always love his work, the colors make it impossible for me to do anything but smile! 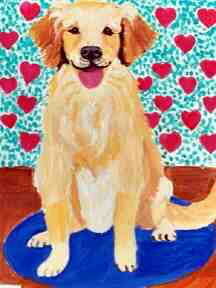 Pat Long, Berwyn PA"
A Valentine Painting to download and print! The beardie belongs to a famous author of dog books. 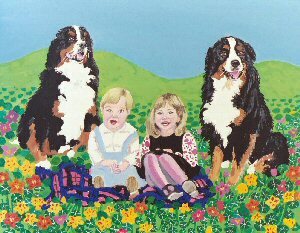 The goldens and the English setters belong to a family in California and the Berner belongs to a horse trainer in NY. Happy Valentines Day from Michael! 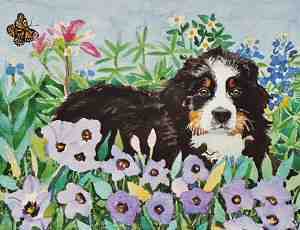 This pup has blue bellflowers. These following two paintings of Cabot are for the Specialty in Texas March '04 and were both from jpgs that Dayna Rousseau sent. Cabot is more formally known as Spellbound's Cabot v Peacefield . His sire is Ch. Lin Car's Code of Skylands, dam is Peacefield's Seairha. 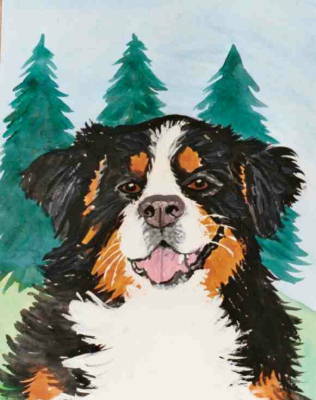 We sent Dayna a sketch of Cabot that Michael did when he was learning how to paint the berner pup for the watercolor portrait. Dayna had it matted and framed and it is hanging in her home. 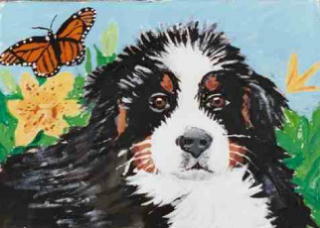 Michael does custom head portraits like the acrylic he painted of Cabot for the Specialty Raffle. 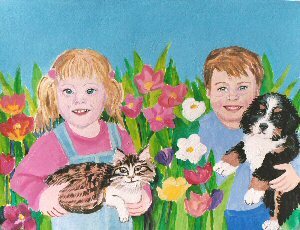 An 8x10 acrylic like that one runs $60 and the customer can pick the flowers and colors for the background. 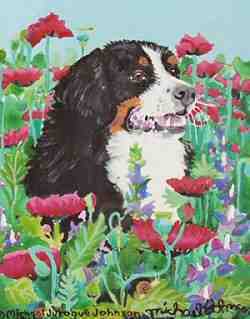 Because the Specialty is in Texas, Michael had fun painting wildflowers that might be seen growing there. 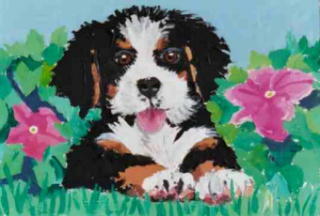 The watercolor portrait of Cabot commissioned for the Health Fund auction at the Specialty. In the front are Texas bluebells. In the back is an Indian Paintbrush, some bluebonnets, and a Monarch butterfly. 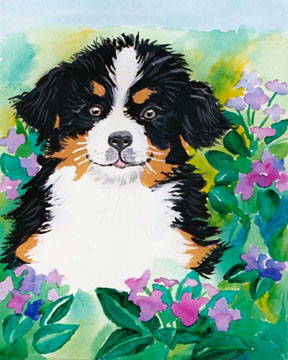 Acrylic portrait of Cabot as an adult berner in a field of poppies and blue larkspur that Michael painted for BMD National Specialty general raffle. Pat Long shared the jpg that inspired this painting. Berner Pup at the lake. OK! 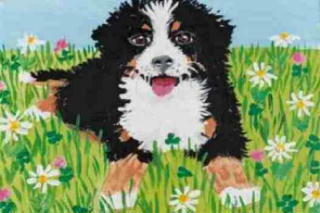 This is not a Bernese! Is a Goldie! But Michael's 2004 Valentine Greeting! Ruth Reynolds helped Michael with suggestions about eye color and shape. I like the soft expression in these eyes. 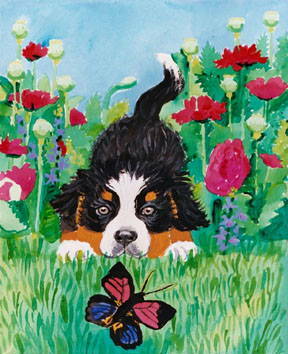 Michael has been practicing painting puppy eyes for the commission for the Bernese Mountain Dog National Specialty. He is getting good. Michael also discovered that he can use thin washes of acrylics like watercolors on the watercolor board. The colors stay fresh and crisp. Makes a nice background. 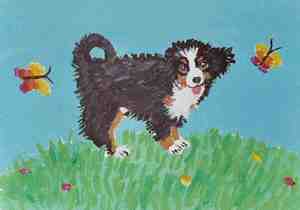 Then he uses thicker paint for the dog. 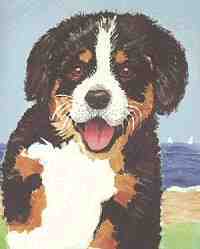 There are also some new laminated posters with berners. The butterfly is a South American species. 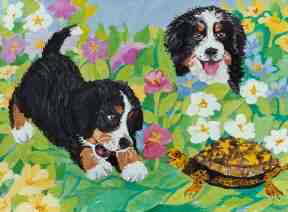 Michael got interested in the butterflies in Brazil when he was painting an illustration for a dog show in Brazil next month. 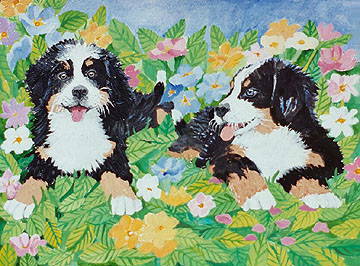 The flowers in this painting were inspired by a patch of flowers on the Northwestern University Campus. 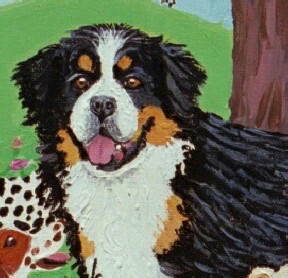 Michael has been commissioned to paint a watercolor portrait of a puppy named Cabot for the Berner National . Cabot's owner sent him a jpg of the pup sticking his head out of a flower bed and Michael started playing with it. Cabot is the puppy on the left. The photography is excellent and Michael was able to get pretty good details in this acrylic painting. He hopes to get some more jpgs of Cabot soon so he can practice some more! 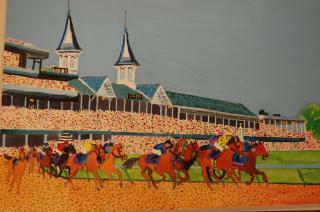 Here is the second painting Michael did from the jpg of Cabot. He is the puppy on the right. 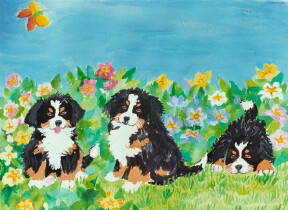 These three Berner pups are also available on a notecard. One of Michael/s fans sent a head shot jpg of her border collie and Michael noticed the white spot that light makes at the top of the eyes. 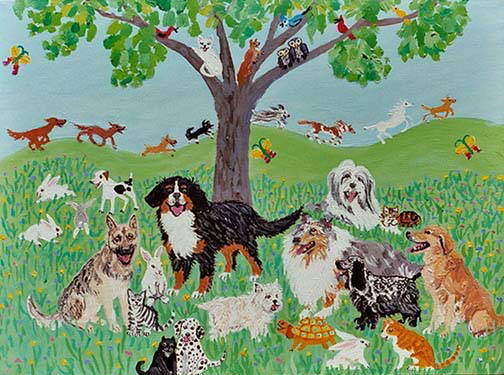 He has been painting all of his animals and children that way........with the white spot of light reflection and the darker spot of the pupil. Makes it look a lot better than when he was painting just an opaque spot of color for the eye. He's getting better all the time! Way to go, Michael, love your pictures! 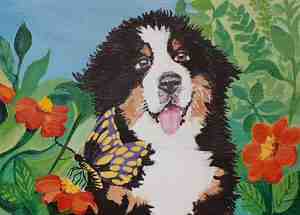 Here is a happy berner painting to download and print. 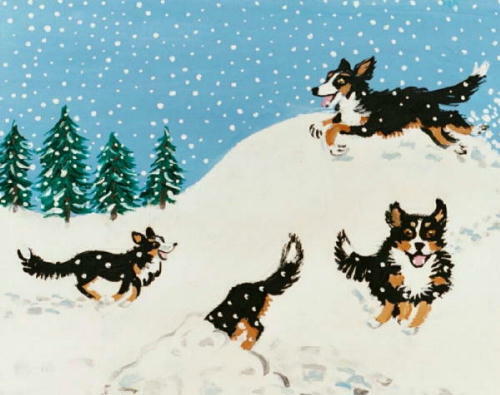 It was inspired by Pooch Park, a new off-leash dog park that just opened in our community. They have an agility course. Michael can do research for some paintings. 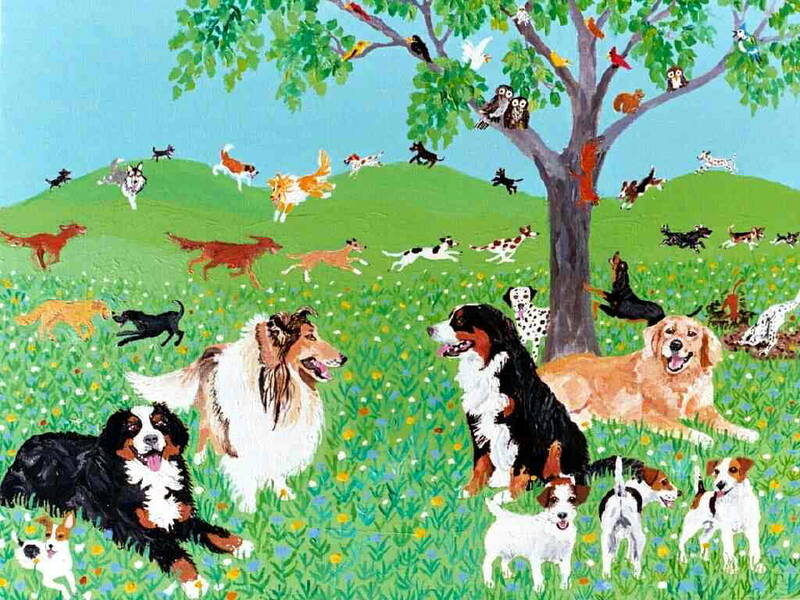 But this is how the dog park looks in his imagination! Michael won a national poster contest. http://michaelsart.landofpuregold.com has an image of his painting "Pets Make The Difference" which will be used to promote National Pet Week in 2003. 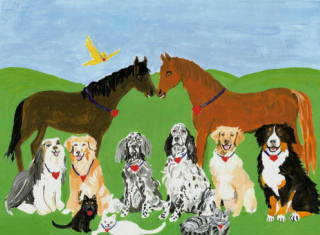 His art will hang in veterinary hospitals and humane societies across the USA. It is the first contest he ever entered.